Tulare County is a rather large county near the southern end of the Sierra Nevada range. Tulare County was created in 1852, with its seat at Woodville, and once extended through Death Valley to Nevada to the east and to about Mt. Pinos in the west. The county seat moved in Visalia by 1855, and over time the county was dismembered until it reached its current boundaries in 1893. The county has a very wide range of interior habitats. It includes a large chunk of the San Joaquin Valley floor, and within that area Pixley NWR hosts huge flocks of cranes and ibis in winter. The county then extends up the western slope of the Sierra to the crest. Most of Sequoia National Park is within the county. Parts of the recently created Sequoia National Monument are also in the county, and especially birdy are mountain meadows upslope from Porterville (including Quaking Aspen, Redwood, and Holey meadows). 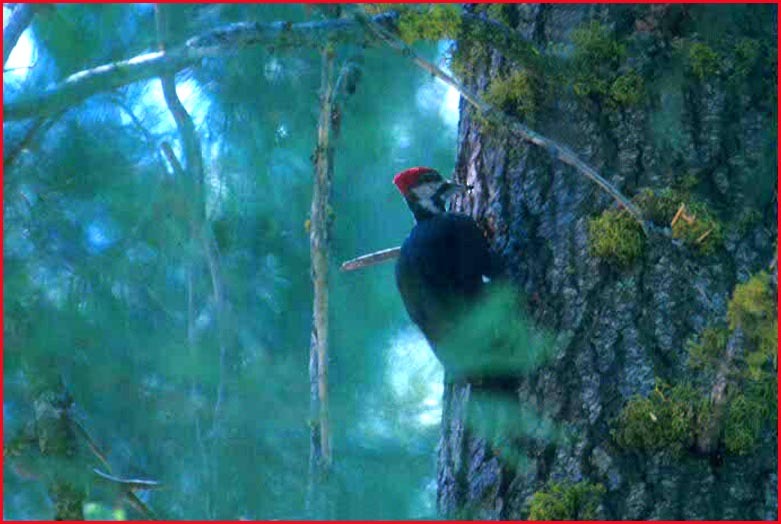 For Tulare County the featured photo is of a Pileated Woodpecker in Sequoia National Park. It is not a very good picture of the woodpecker but it does show the heavy forest within which it resides. 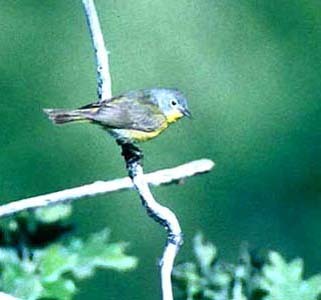 A couple of other shots from Sequoia Park are below, both of them birds on territory in June: a Nashville Warbler (below left; 20 June 1997) and a Fox Sparrow (below right; 12 May 2002). 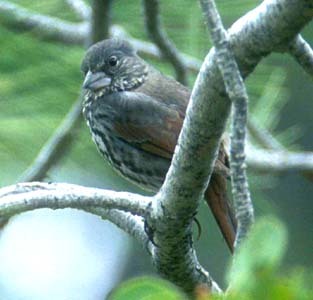 The Fox Sparrow has the huge bill characteristic of the megarhyncha group that breed in this stretch of the Sierra. Sequoia National Park has a wonderful variety of habitats, two of which are shown here (June 1997): a view down the Marble Fork of the Kaweah River, and the lovely fir-encircled Crescent Meadow.